Imagine traveling across the Texas Panhandle and eyeing a farmhouse, vacant, decaying, and leaning precariously after being howled by winds for nearly a century. Filled with curiosity, you pull your car over, trudge across what used to be a wheat field, and take a closer look. The door is ajar so you enter. The floor is scattered with dust, tumbleweeds, dead locusts, and a trunk. Inside the trunk, you find old photographs strewn every which way and, intrigued, you start pulling them out one-by-one for a closer look. Gradually, pictures of the newly built farmhouse; freight trains stacked with human cargo; horses grazing; a man, a woman, and a young girl sharing a picnic (are they husband, wife, and daughter? 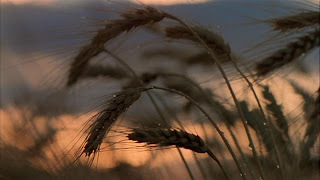 ); farm workers harvesting wheat; a congregation with heads bowed in prayer; and locusts, very much alive, crawling over a kitchen table all start to coalesce into a story. The story follows a young man (a very young Richard Gere), his lover who pretends to be his sister, and his actual young sister, the story’s narrator. They are on the run. Did he actually murder that man? We can’t be sure. They find work as hired hands on a harvest. The farm owner is young and handsome (Sam Shepard) and dying. Seeing an opportunity to gain riches, the young woman marries the farm owner. But, marriage has a rejuvenating effect on him. He stops dying. Will he die? Or will she fall in love with him for real? Talking about Days of Heaven in terms of plot is almost to misrepresent it. Malick spent many long days waiting until magic hour working with cinematographer Néstor Almendros to craft one stunning light painting after another. The rest of each day was spent with macro lenses capturing the minutiae of farm existence in screen-filling extreme close-ups. He then spent a legendary two years in the editing room stitching the countless pictures together, first one way, and then many others, until an eye-pleasing perfection was achieved. Haunting music and Linda Manz’s offhand, highly influential narration, full of unfinished thoughts and stray tangents are the glue that finally binds this most remarkably singular work of art together. I wouldn’t be surprised if one day I came across the reclusive Malick’s unpublished memoirs, possibly in a trunk in an old abandoned farm house, and he admitted to editing Days of Heaven by stretching out on the floor with his footage and squinting and rearranging the strips until the many voices started to whisper to him from distant days when Heaven was so close and yet so far.